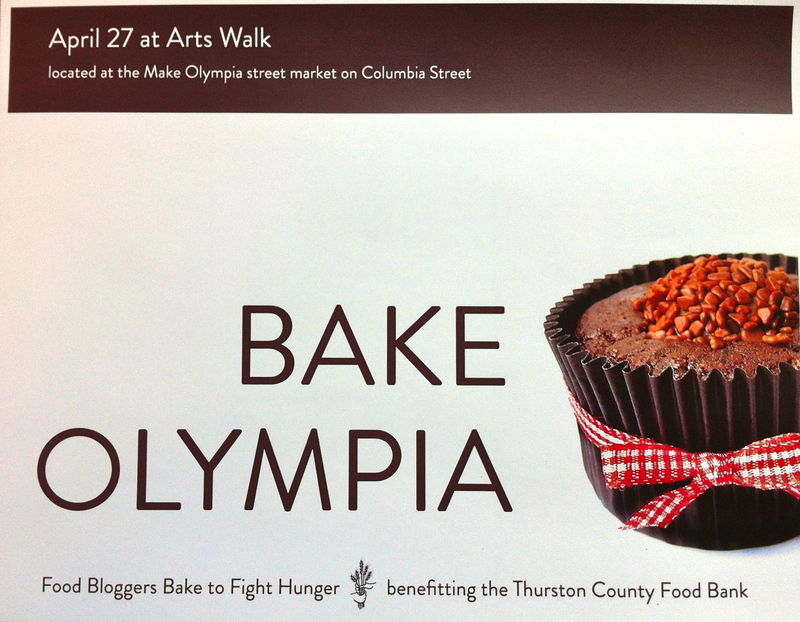 I am so very excited to announce that I have been invited to participate in Olympia’s first food bloggers bake sale. Next Friday, April 27th local food bloggers are teaming up to raise money for the Thurston County Food Bank. The blogging brains behind this amazing event is Jenni from The Plum Palate, you should check out her blog and the list of other bloggers participating. Later this week I will be whipping up a very large batch of cookie which I will preview for you all, just to make sure you are good and excited about all the delicious baked goods. Really, I can’t think of anything better than a food blogger bake sale because you know unequivocally the treats will be top-notch, plus you get to meet some pretty rad Olympians. All proceeds will go to support the Thurston County Food Bank, you can bring cash or a food item to donate, and take home some of the best bake goods in town. You can also enter a raffle to win gift certificates for local bakeries. This entry was posted in Bake Olympia, Eat Local, Event, Food Revolution and tagged Arts Walk, Bake Olympia, Bake Sale, Local Food, Make Olympia, Thurston County Food Bank. Bookmark the permalink. We are so thrilled you’ll be baking, Liz! Thanks for getting the word out. Personally, I can’t wait to sample all the goodies.